I think the name I picked for this dessert is 100% spot-on! A Fantasy it is, alright ! But, this fantasy you can whip up in no time at all. There is no need to wait for setting, no cooking/baking – unless you count melted chocolate as cooking. It took me all of 10 minutes to make 6 of these delicious treats. My son is a huge fan of Caramel Minty Desserts and I have actually made a copy-cat dessert from one of our popular chain restaurants. With a small change or two and now he actually prefers my version which you can find at the HERE. This recipe I am sharing today, is very similar, but also a little different. You know, just to change things up a bit, but still including most of our favorite key ingredients. 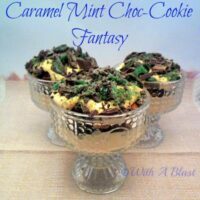 Behind chocolate and peanut butter, chocolate and mint is the next best thing 🙂 I love easy – pinned this, Linda! Umm if I could somehow install you in my kitchen I would be a very happy camper! Linda this looks like a perfect Summer dessert, especially for all the end of year BBQ's! You are certainly the dessert queen! Glad i saw this tonight instead of morning!! This looks amazing! I love any desserts that are quick and easy to make. Your presentation of this dish is so lovely. ooh girl those look good! 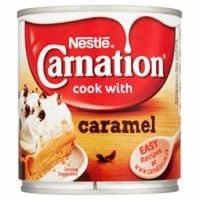 I love all things caramel. Thanks for linking to What'd You Do This Weekend. Pinning this. I would love to have dessert like this today! Looks yummy! Give me a steamy romance novel & a serving of this…that's my fantasy!